TIBURON, Calif. -- Mitchell Krueger was all set to attend Texas A&M. Krueger, from Aledo, Texas, in the Dallas-Fort Worth area, had grown up with many of the Aggies. Also, his father, Myron, played at Texas A&M, and his sister, Mandi, was studying business as a senior there. So Mitchell signed a letter of intent with the Aggies in November 2011. But the following year, Krueger reached the boys semifinals at the French Open and Wimbledon. "I was a pretty good junior in the world and able to get some sponsors like Nike and my racket company (Tecnifibre)," Krueger explained after upsetting eighth-seeded Jared Donaldson 6-3, 7-6 (3) today in the second round of the $100,000 Wells Fargo Tiburon Challenger. "The USTA has a coach (Stanford Boster) I've been fortunate to have for the last three years. From my perspective, the window for being a professional tennis player isn't that big, and you can always go back to school." Donaldson, an 18-year-old pro, saved three match points serving at 5-6 in the second set of a hard-hitting battle against Krueger, 21, at the Tiburon Peninsula Club. Krueger will face another 18-year-old, Quentin Halys of France, in Friday's quarterfinals. Halys, last year's U.S. Open boys runner-up, defeated Brydan Klein of Great Britain 7-6 (2), 6-2. Klein had ousted No. 2 seed and countryman Kyle Edmund in the first round. Halys overcame a nasty fall on a damp section of the court near the back fence early in the match. Rain had delayed the start of play by 3 1/2 hours. Krueger has improved from No. 361 in the world at the beginning of the year to No. 240. He has reached one semifinal (Lexington, Ky.) and four other quarterfinals on the Challenger circuit in 2015. Donaldson has punishing, flat groundstrokes, especially on the forehand side, but Krueger managed to keep the ball in play long enough to induce errors. Krueger led 2-0 and 3-1 in the first set against Donaldson and maintained his momentum to win the set. He lost his serve in the first game of the second set after leading 40-15 but broke back for 3-3. Both players held serve from there -- although Donaldson almost faltered at 5-6 -- to force a tiebreaker. After Donaldson scored a minibreak for 2-2, Krueger won five of the next six points for the match as Donaldson struggled with his first serve and backhand. Donaldson mocked Krueger during their first career meeting for allegedly getting too excited after winning big points, and Krueger mocked Donaldson right back. Krueger, though, shrugged off the friction afterward. "That's just two competitive guys trying to win the match," he said. "We're friends off the court. There's no bad blood or anything." Krueger, meanwhile, is happy with his decision to turn pro out of high school. "I'm really happy," he said. "I've been doing well. It takes a while to get yourself going, but I've made improvements every year. I just have to keep improving." The rain forced four doubles matches to be postponed until Thursday. All four scheduled matches in singles and two in doubles were completed. Blaz Rola (7), Slovenia, def. Dimitar Kutrovsky, Bulgaria, 6-3, 6-1. Denis Kudla (1), United States, def. Henri Laaksonen, Switzerland, 2-6, 6-4, 6-3. Quentin Halys, France, def. Brydan Klein, Great Britain, 7-6 (2), 6-2. Mitchell Krueger, United States, def. Jared Donaldson (8), United States, 6-3, 7-6 (3). Johan Brunstrom, Sweden, and Frederik Nielsen (1), Denmark, def. Ariel Behar, Uruguay, and Ruben Gonzales, Philippines, 6-2, 6-2. Deiton Baughman, United States, and Mackenzie McDonald, Piedmont, def. Dean O'Brien and Ruan Roelofse (2), South Africa, 4-6, 6-3 [10-4]. Ryan Harrison, United States, vs. Marek Michalicka, Czech Republic. Bjorn Fratangelo (6), United States, vs. Alex Kuznetsov, United States. Tim Smyczek (3), United States, vs. Dennis Nevolo, United States. Johan Brunstom, Sweden, and Frederik Nielsen (1), Denmark, vs. Adrien Bossel, Switzerland, and Quentin Halys, France, or Brydan Klein, Great Britain, and Jose Statham, New Zealand. Sekou Bangoura, United States, vs. Mackenzie McDonald, Piedmont. Dennis Novikov, Milpitas, and Julio Peralta, Chile, vs. Chase Buchanan, United States, and Blaz Rola, Slovenia. Philip Bester and Peter Polansky, Canada, vs. Mitchell Krueger and Connor Smith, United States. Carsten Ball and Matt Reid (4), Australia, vs. Sekou Bangoura, United States, and Marek Michalicka, Czech Republic. Adrien Bossel, Switzerland, and Quentin Halys, France, vs. Brydan Klein, Great Britain, and Jose Statham, New Zealand. Dustin Brown, Germany, and Denis Kudla, United States, vs. Andre Goransson, Cal/Sweden, and Florian Lakat, Cal/France. Dennis Novikov, Milpitas, and Julio Peralta, Chile, or Chase Buchanan, United States, and Blaz Rola, Slovenia, vs. Dustin Brown, Germany, and Denis Kudla, United States, or Andre Goransson, Cal/Sweden, and Florian Lakat, Cal/France. Sam Riffice of Roseville in the Sacramento area was injured in the United States' 2-1 victory over Brazil today in the Junior Davis Cup in Madrid. Riffice, 16, retired with a hamstring injury at 1-6, 4-3 against Gabriel Decamps in No. 1 singles. The U.S. lost its No. 2 singles player, Gianni Ross, last week because of illness. He was replaced by Patrick Kypson, who won today in singles and doubles (with Vasil Kirkov). The third-seeded United States is scheduled to play eighth-seeded Japan on Thursday for a berth in the semifinals. Japan beat Spain 2-1.
round of the $100,000 Wells Fargo Tiburon Challenger. TIBURON, Calif. -- Of all people, Dustin Brown should know to beware of qualifiers. As a qualifier at Wimbledon this past summer, Brown stunned two-time champion Rafael Nadal in the second round on Centre Court before losing to 22nd-seeded Viktor Troicki of Serbia in the third round. Today, the tennis shoe was on the other foot as the fourth-seeded Brown of Germany lost to qualifier Sekou Bangoura of Tampa, Fla., 6-2, 7-5 in the first round of the $100,000 Wells Fargo Tiburon Challenger at the Tiburon Peninsula Club. "It's a good feeling," the 419th-ranked Bangoura said of beating Nadal's conqueror, ranked No. 105. "It's a good win definitely, but I have to play (Thursday), so that's what I'm worried about right now." That's typical of the businesslike Bangoura, who will meet 20-year-old wild card Mackenzie McDonald of Piedmont in the San Francisco Bay Area for the first time on Thursday. McDonald, a junior All-American at UCLA, defeated Frederik Nielsen, the 2012 Wimbledon doubles champion with Jonathan Marray, 6-4, 6-4. Bangoura, 23, is as low-key and polite as Brown, 30, is flashy and combustible. --Deliberately swatted a return of serve in the net after an overrule went against him. --Was warned for an audible obscenity in German that even the American chair umpire understood. --Mildly argued that one of his shots hit Bangoura in the chest at the net. That would have given Brown the point, but it went to Bangoura on a reflex volley. --Chided Bangoura for not apologizing after hitting a net-cord winner in the final game. After Brown netted a forehand return of a second serve on Bangoura's first match point, the winner celebrated with only a small fist-pump. When the players shook hands at the net, Brown had a few choice words for Bangoura. "He said that ball hit my chest and that I had a great attitude," Bangoura said. "He was being a little sarcastic, but it's no big deal." When pressed, Bangoura said the ball in question "hit my racket first, then my racket hit my chest." Immediately after the match, Bangoura adjourned to a side court for 15 minutes of practice. Meanwhile, Brown rushed off the site and was unavailable for comment. When Bangoura was asked for an interview in the locker room, he replied, "Of course." Bangoura repeatedly called a reporter "sir" and asked the writer to repeat his name afterward. Both Bangoura and Brown have unusual backgrounds. Bangoura was born in Bradenton, Fla., to a father from Guinea, West Africa, and an American mother. Sekou Sr. teaches tennis at Sarasota (Fla.) Country Club, and Cheryl works at an insurance company in Sarasota. Sekou Jr. was called a child prodigy because of his accomplishments not only in tennis but golf, chess and piano. He was featured in Sports Illustrated at 15, attained No. 1 nationally in tennis in the 18s and attended the University of Florida for 1 1/2 years, earning All-America status in doubles in 2011. Brown has a Jamaican father (Leroy) and German mother (Inge), and a tattoo of his father on his stomach. Brown's appearance is also distinctive. He's rail thin at 6-foot-5 (1.96 meters) and 172 pounds (78 kilograms), and he has dreadlocks that cascade down his back almost to his waist. Today, his shorts, sleeveless shirt and socks were royal blue. He wore a necklace and earrings and neon orange laces on one shoe and neon chartreuse laces on the other. hits a drop shot against Bangoura. Then there's Brown's game, a wacky mixture of power and touch. He'll blast his serve and forehand, then throw in a drop shot out of nowhere while nonchalantly standing flat-footed. Most of his drop shots against Bangoura were ineffective, and some were laughably short. He even hit a drop-shot overhead for a winner early in the match. Despite Brown's erratic play and dubious shot selection, Bangoura called his opponent's game "impressive. He does some nasty stuff with the ball. He puts balls where he wants. He plays smart. It's cool to watch, and it's cool to play against, but it's also tough to play against because you don't really get a rhythm. I definitely have a lot of respect for him." In truth, there were multiple danger signs for Brown entering the match. First, Brown beat Nadal on grass (for the second time to improve to 2-0 against the former world No. 1), and the Tiburon Challenger is on hardcourts. And while Bangoura was winning three qualifying matches outdoors in Tiburon, Brown had to adjust from playing indoors last week in Metz, France, on the elite ATP World Tour. He lost to fourth-ranked Stan Wawrinka 7-6 in the third set in the second round in Metz. "I've been here a little bit longer than he has," Bangoura said, "and I've played on the courts a little bit more, so I tried to use that to my advantage. It worked." Also, when you've starred on Centre Court at Wimbledon, it's psychologically difficult to drop to a Challenger. "I'm sure it is," Bangoura said. "I go through that a little bit playing Challengers and then going back to Futures. It's a little different dynamic. I'm sure it's a lot bigger change for him coming from Grand Slams." As for Bangoura, he beat then-No. 65 Lucas Pouille of France last month in the second round of qualifying in Winston-Salem, N.C., on the ATP World Tour. Bangoura said his game plan against Brown was: "Try not to give him too much pace and keep balls to his backhand corner. His forehand is big; he serves big. Just try to survive his flair, survive his big slaps and put balls back in the court." That's exactly what Bangoura did. Bangoura bolted to a 5-1 lead in the first set and served it out. He broke for 4-3 in the second set, but Brown broke right back. After both players held serve for 5-5, Brown lost his serve at 15 on a shanked forehand. Bangoura, serving for the match, shook off a double fault that landed way long for 15-15 to win the next three points for the match. "I just put more balls in the court," Bangoura said of the match. "At the end of the day, that's what you've got to do, no matter how you do it." Wild card Andre Goransson, a Cal junior from Sweden, fell to qualifier Henri Laaksonen of Switzerland 6-2, 6-4. Laaksonen earned a matchup with top-seeded Denis Kudla of Arlington, Va., and Tampa today. Bjorn Fratangelo (6), United States, def. Chase Buchanan, United States, 6-1, 6-3. Tim Smyczek (3), United States, def. James McGee, Ireland, 7-6 (5), 6-4. Ryan Harrison (5), United States, def. Deiton Baughman, United States, 6-3, 6-3. Sekou Bangoura, United States, def. Dustin Brown (4), Germany, 6-2, 7-5. Mitchell Krueger, United States, def. Philip Bester, Canada, 6-4, 6-7 (5), 6-1. Blaz Rola (7), Slovenia, def. Frances Taifoe, United States, 6-7 (0), 7-6 (6), 6-3. Marek Michalicka, Czech Republic, def. Dennis Novikov, United States, 6-4, 6-3. Dennis Nevolo, United States, def. Adrien Bossel, Switzerland, 7-5, 7-6 (5). Alex Kuznetsov, United States, def. Nicolas Meister, United States, 7-6 (4), 6-3. Mackenzie McDonald, United States, def. Frederik Nielsen, Denmark, 6-4, 6-4. Henri Laaksonen, Switzerland, def. Andre Goransson, Sweden, 6-2, 6-4. Carsten Ball and Matt Reid (4), Australia, def. Tennys Sandgren and Tim Smyczek, United States, 7-6 (6), 3-6 [17-15]. Blaz Rola (7), Slovenia, vs. Dimitar Kutrovsky, Bulgaria. Denis Kudla (1), United States, vs. Henri Laaksonen, Switzerland. Johan Brunstrom, Sweden, and Frederik Nielsen (1), Denmark, vs. Ariel Behar, Uruguay, and Ruben Gonzales, Philippines. Dean O'Brien and Ruan Roelofse (2), South Africa, vs. Deiton Baughman and Mackenzie McDonald, United States. Brydan Klein, Great Britain, vs. Quentin Halys, France. Jared Donaldson (8), United States, vs. Mitchell Krueger, United States. Brydan Klein, Great Britain, and Jose Statham, New Zealand, vs. Adrien Bossel, Switzerland, and Quentin Halys, France. Dennis Novikov, United States, and Julio Peralta (3), Chile, vs. Chase Buchanan, United States, and Blaz Rola, Slovenia. Dustin Brown, Germany, and Denis Kudla, United States, vs. Andre Goransson, Sweden, and Florian Lakat, France. No. 2 seed Kyle Edmund of Great Britain lost in the first round of the $100,000 Wells Fargo Tiburon Challenger today, and No. 1 Denis Kudla came within two points of joining him on the sideline. Edmund, 20, fell to countryman Brydan Klein 6-4, 6-1 at the Tiburon Peninsula Club. Kudla then defeated fellow American Connor Smith 4-6, 7-6 (2), 6-0. Smith, 24, served for the match at 5-3 in the second set. Kudla, a 23-year-old resident of Arlington, Va., and Tampa, Fla., was playing in his first match since losing to former top-10 player Jurgen Melzer, a 34-year-old Austrian, in the first round of the U.S. Open four weeks ago. In July, Kudla became the only American man to reach the second week of Wimbledon. He lost to 2014 U.S. Open champion Marin Cilic in the fourth round. Also falling on Monday was 2013 Tiburon champion Peter Polansky. The 27-year-old Canadian bowed out to Bulgarian Dimitar Kutrovsky, a former University of Texas All-American who uses two hands on both sides, 6-4, 6-3. Quentin Halys, an 18-year-old Frenchman, dismissed Tennys Sandgren, 24, of Wesley Chapel, Fla., 6-3, 6-1. Last year in the juniors, Halys advanced to the U.S. Open singles final and won the French Open doubles title with countryman Benjamin Bonzi. Sandgren, who played for the Sacramento-based California Dream of World TeamTennis in July, reached the Tiburon quarterfinals two years ago. He underwent hip surgery last year and missed more than six months. Tom Fawcett, a 6-foot-6 (1.98-meter) sophomore at Stanford, lost to fifth-seeded Henri Laaksonen of Switzerland 6-4, 6-2 in the final round of qualifying. Henri Laaksonen (5), Switzerland, def. Tom Fawcett, United States, 6-4, 6-2. Dennis Nevolo, United States, def. Marcos Giron (7), United States, 7-6 (3), 5-7, 7-5. Sekou Bangoura, United States, def. Andre Dome, United States, 6-3, 6-3. Nicolas Meister, United States, def. Jose Statham, New Zealand, 7-6 (4), 5-7, 6-4. Jared Donaldson (8), United States, def. Darian King, Barbados, 6-1, 6-4. Brydan Klein, Great Britain, def. Kyle Edmund (2), Great Britain, 6-4, 6-1. Denis Kudla (1), United States, def. Connor Smith, United States, 4-6, 7-6 (2), 6-0. Quentin Halys, France, def. Tennys Sandgren, United States, 6-3, 6-1. Dimitar Kutrovsky, Bulgaria, def. Peter Polansky, Canada, 6-4, 6-3. Adrien Bossel, Switzerland, and Quentin Halys, France, def. John Paul Fruttero, United States, and Ben McLachlan, New Zealand, 4-6, 6-3 [10-7]. Sekou Bangoura, United States, and Marek Michalicka, Czech Republic, def. Andre Dome and Eric Johnson, United States, 6-4, 6-4. Bjorn Fratangelo (6), United States, vs. Chase Buchanan, United States. Tim Smyczek (3), United States, vs. James McGee, Ireland. Ryan Harrison (5), United States, vs. Deiton Baughman, United States. Dustin Brown (4), Germany, vs. Sekou Bangoura, United States. Mitchell Krueger, United States, vs. Philip Bester, Canada. Blaz Rola (7), Slovenia, vs. Frances Taifoe, United States. Dennis Novikov, United States, vs. Marek Michalicka, Czech Republic. Carsten Ball and Matt Reid (4), Australia, vs. Tennys Sandgren and Tim Smyczek, United States. Adrien Bossel, Switzerland, vs. Dennis Nevolo, United States. Alex Kuznetsov, United States, vs. Nicolas Meister, United States. Frederik Nielsen, Denmark, vs. Mackenzie McDonald, United States. Henri Laaksonen, Switzerland, vs. Andre Goransson, Sweden. Sam Querrey, a San Francisco native, isn't defending his title in the Tiburon Challenger this week. But another 6-foot-6 (1.98-meter) American with Bay Area ties pulled off a big upset on Sunday in qualifying for the $100,000 Wells Fargo Tiburon Challenger. Wild card Tom Fawcett, a Stanford sophomore from Winnetka, Ill., ousted fourth-seeded Matt Reid of Australia 7-6 (4), 6-2 at the Tiburon Peninsula Club. Reid reached last year's semifinals as a qualifier. Fawcett is scheduled to meet fifth-seeded Henri Laaksonen of Switzerland today at 10 a.m. for a berth in the main draw. The top two qualifying seeds also lost on Sunday. No. 1 Benjamin Mitchell, a 2013 quarterfinalist from Australia, fell to American Sekou Bangoura 7-5, 6-3. No. 2 Joshua Milton of Great Britain retired after losing the first set to American Dennis Nevolo, a former University of Illinois All-American, 6-2. Meanwhile, Dennis Novikov of Milpitas in the Bay Area could meet Ryan Harrison of Austin, Texas, for the third straight week. But this time, it would be in the second round. Novikov, 21, beat Harrison, 23, in a $50,000 Challenger final for the second straight week on Sunday. Novikov, seeded eighth, topped Harrison, seeded fourth, 6-4, 3-6, 6-3 in Columbus, Ohio, after winning 6-4, 7-5 in Cary, N.C.
Harrison, the 2010 Tiburon runner-up to Tobias Kamke of Germany, is seeded fifth this year. Novikov is unseeded. Nicolas Meister (3), United States, def. Conor Berg, United States, 6-4, 6-0. Sekou Bangoura, United States, def. Benjamin Mitchell (1), Australia, 7-5, 6-3. Tom Fawcett, United States, def. Matt Reid (4), Australia, 7-6 (4), 6-2. Jose Statham (6), New Zealand, def. Bernardo Saraiva, Portugal, 6-3, 6-2. Dennis Nevolo, United States, def. Joshua Milton (2), Great Britain, 6-2, 0-0, retired. Henri Laaksonen (5), Switzerland, def. Eric Johnson, United States, 5-7, 6-1, 6-4. Marcos Giron (7), United States, def. Filip Bergevi, Sweden, 7-6, (3), 6-1. Andre Dome (8), United States, def. Joseph Cadogan, Trinidad and Tobago, 6-1, 6-2. Henri Laaksonen (5), Switzerland, vs. Tom Fawcett, United States (final-round qualifying). Jared Donaldson (8), United States, vs. Darian King, Barbados. Kyle Edmund (2), Great Britain, vs. Brydan Klein, Great Britain. Denis Kudla (1), United States, vs. Connor Smith, United States. Marcos Giron (7), United States, vs. Dennis Nevolo, United States (final-round qualifying). Tennys Sandgren, United States, vs. Quentin Halys, France. Peter Polansky, Canada, vs. Dimitar Kutrovsky, Bulgaria. Sekou Bangoura, United States, and Marek Michalicka, Czech Republic, vs. Andre Dome and Eric Johnson, United States. Sekou Bangoura, United States, vs. Andre Dome, United States (final-round qualifying). Nicolas Meister, United States, vs. Jose Statham, New Zealand (final-round qualifying). John Paul Fruttero, United States, and Ben McLachlan, New Zealand, vs. Adrien Bossel, Switzerland, and Quentin Halys, France. Top-seeded Denis Kudla will face fellow American Connor Smith on Monday or Tuesday in the first round of the $100,000 Wells Fargo Tiburon Challenger at the Tiburon Peninsula Club. The draw was conducted on Saturday, and Monday's schedule will be announced today. Kudla, the only American man to reach the second week in singles at Wimbledon this summer, is ranked No. 76 in the world. He advanced to the Tiburon semifinals two years ago as the top seed but lost in the first round last year to Jordan Thompson of Australia as the fifth seed. Smith, a former Ohio State star, is ranked No. 235. Fourth-seeded Dustin Brown of Germany will face a qualifier to be determined. Brown shocked two-time champion Rafael Nadal en route to the third round at Wimbledon this year as a qualifier. The Tiburon draw features two San Francisco Bay Area residents: Dennis Novikov of Milpitas and wild card Mackenzie McDonald of Piedmont. Novikov, who's bidding for his second Challenger title in two weeks today in Columbus, Ohio, will play Marek Michalicka of the Czech Republic. McDonald, a UCLA junior from Piedmont, will take on Frederik Nielsen of Denmark. In 2012, Nielsen and Jonathan Marray of Great Britain became the only wild cards to win the Wimbledon men's doubles title. Wild card Andre Goransson, a Cal junior from Sweden, drew a qualifier to be determined. Dennis Nevolo, United States, def. Ben McLachlan, New Zealand, 4-6, 6-2, 6-2. Conor Berg, United States, def. Paul Barreto, United States, 6-4, 4-6, 6-3. Sekou Bangoura, United States, def. Sameer Kumar, United States, 6-1, 6-0. Filip Bergevi, Sweden, def. Maxime Tchoutakian, France, 7-6 (5), 6-3. Joseph Cadogan, Trinidad and Tobago, def. Noah Newman, United States, 3-6, 7-6 (4), 6-1. Eric Johnson, United States, def. Sebastian Fanselow, Germany, 6-1, 6-1. Bernardo Saraiva, Portugal, def. Takanyi Garanganga, Zimbabwe, 4-6, 7-5, 3-0, retired. Nicolas Meister (3), United States,vs. Conor Berg, United States. Benjamin Mitchell (1), Australia, vs. Sekou Bangoura, United States. Matt Reid (4), Australia, vs. Tom Fawcett, United States. Jose Statham (6), New Zealand, vs. Bernardo Saraiva, Portugal. Joshua Milton (2), Great Britain, vs. Dennis Nevolo, United States. Henri Laaksonen (5), Switzerland, vs. Eric Johnson, United States. Marcos Giron (7), United States, vs. Filip Bergevi, Sweden. Andre Dome (8), United States, vs. Joseph Cadogan, Trinidad and Tobago. Two players who made a splash at Wimbledon this summer are entered in next week's $100,000 Wells Fargo Tiburon Challenger at the Tiburon Peninsula Club. Wild card Denis Kudla was the only American man to reach the second week at Wimbledon, and qualifier Dustin Brown of Germany stunned two-time champion Rafael Nadal en route to the third round at the All-England Club. Kudla, after losing to 2014 U.S. Open champion Marin Cilic in the round of 16 at Wimbledon, qualified for Atlanta and defeated then-No. 35 Jack Sock en route to the semifinals. Kudla tops the Tiburon entry list with a world ranking of No. 76. Following the 23-year-old resident of Arlington, Va., and Tampa, Fla., are 20-year-old Kyle Edmund (101) of Great Britain, Tim Smyczek (106) of Tampa Fla., the 30-year-old Brown (107), Ryan Harrison (116) of Austin, Texas, Bjorn Fratangelo (118) of Boca Raton, Fla., Blaz Rola (139) of Slovenia and 18-year-old Jared Donaldson (143) of Irvine, Calif.
All also plan to play in the $100,000 Sacramento Pro Circuit Challenger at the Natomas Racquet Club the week after Tiburon, and all except Kudla are entered in the $50,000 Fairfield Men's Pro Challenger at In Shape: Fairfield Rancho Solano the week after Sacramento. Tiburon qualifying starts today, and the main draw begins on Monday. Ben McLachlan, New Zealand, vs. Dennis Nevolo, United States. Conor Berg, United States, vs. Paul Barreto, United States. Sekou Bangoura, United States, vs. Sameer Kumar, United States. Filip Bergevi, Sweden, vs. Maxime Tchoutakian, France. Joseph Cadogan, Trinidad and Tobago, vs. Noah Newman, United States. Sebastian Fanselow, Germany, vs. Eric Johnson, United States. Takanyi Garanganga, Zimbabwe, vs. Bernardo Saraiva, Portugal. Dennis Novikov, playing doubles in the recent U.S.
Dennis Novikov of Milpitas in the San Francisco Bay Area soared 45 places in the world rankings to a career-high No. 163 in the world by winning his first career Challenger singles title on Sunday. The seventh-seeded Novikov, 21, beat fifth-seeded Ryan Harrison of Austin, Texas, 6-4, 7-5 on a hardcourt in the final of the $50,000 Cary (N.C.) Tennis Championships. Novikov, a 6-foot-3 (1.90-meter) Moscow native, turned pro in 2013 after leading UCLA to the NCAA final as a sophomore. He won the singles and doubles titles in the USTA Boys 18 National Championships in Kalamazoo, Mich., in 2012 to earn wild cards for both main draws in the U.S. Open. Novikov reached the second round in each event at Flushing Meadows. He shocked 86th-ranked Jerzy Janowicz, a 6-foot-8 (2.03-meter) Pole and Wimbledon semifinalist in 2013, in singles and teamed with Michael Redlicki to knock off U.S. veterans Bobby Reynolds and Michael Russell in doubles. Collin Altamirano, 19-year-old Sacramentan -- No. 914 in singles (-4), 925 in doubles (+11). Bradley Klahn, 25-year-old former Stanford star -- No. 249 in doubles (no change), No. 239 in singles (-9). Scott Lipsky, 34-year-old former Stanford star -- No. 48 in doubles (no change). Mackenzie McDonald, 20-year-old Piedmont resident -- No. 822 in singles (-6), No. 749 in doubles (-23). Dennis Novikov, 21-year-old San Jose resident -- Career-high No. 163 in singles (+45), career-high No. 175 in doubles (no change). Sam Querrey, 27-year-old San Francisco native -- No. 41 in singles (no change), No. 45 in doubles (+1). Tennys Sandgren, 24-year-old member of Sacramento-based California Dream in World TeamTennis -- No. 230 in singles (+17), No. 205 in doubles (+14). Matt Seeberger, 31-year-old Los Altos resident -- No. 161 in doubles (-1). Neal Skupski, 25-year-old member of California Dream -- No. 128 in doubles (-17). Kristie Ahn, 23-year-old former Stanford star -- No. 256 in singles (-8), No. 611 in doubles (+1). CiCi Bellis, 16-year-old resident of Atherton in San Francisco Bay Area -- No. 176 in singles (no change). Alexandra Facey, 22-year-old resident of Cameron Park in Sacramento area -- No. 918 in doubles (-296). Kat Facey, 22-year-old resident of Cameron Park in Sacramento area -- No. 918 in doubles (-296). Jarmila Gajdosova, 28-year-old member of California Dream (2015) -- No. 87 in singles (-6), No. 94 in doubles (-8). Anabel Medina Garrigues, 33-year-old member of California Dream (2015) -- No. 33 (+1) in doubles. Nicole Gibbs, 22-year-old former Stanford star -- No. 144 in singles (-16). Michaela Gordon, 16-year-old resident of Saratoga in San Francisco Bay Area -- No. 688 in singles (-76). Raquel Kops-Jones, 32-year-old San Jose resident and former Cal star -- No. 16 in doubles (-1). Maegan Manasse, 20-year-old Cal junior -- No. 495 in doubles (-3), No. 851 in singles (-16). Maria Sanchez, 25-year-old Modesto product -- No. 81 in doubles (-2), No. 187 in singles (+4). 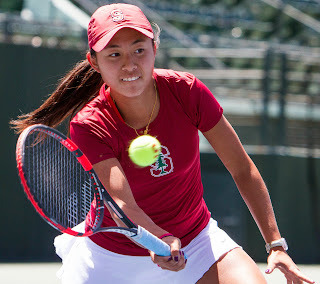 Carol Zhao, 20-year-old Stanford junior -- No. 195 in doubles (no change), No. 440 in singles (-6). Fresno State has hired Luke Shields as the eighth men's tennis coach in school history, athletic director Jim Bartko announced Thursday. Shields has spent the last two seasons as the associate head coach at Boise State, where he was a three-time All-American. The Broncos won their fourth consecutive Mountain West Conference championship last season and advanced to the NCAA Tournament for the fourth straight year. Boise State lost to South Florida 4-0 in Blacksburg, Va., in the first round of the NCAAs to finish 15-16 and ranked 59th nationally. Shields previously served as an assistant coach for the Washington women for two years, helping them reach No. 49 in 2012 and No. 46 in 2013. Shields replaces Evan Austin, who resigned in August after three seasons to become the director at the Smith Stearns Tennis Academy in Hilton Head Island, S.C.
Fresno State finished 16-10 (4-4 Mountain West Conference) last season with a national ranking of No. 65. Friday-Sunday -- Napa Valley Tennis Classic, Meadowood Napa Valley Resort, St. Helena, Calif. Field consists of 24 college players (Cal, Stanford, Baylor, Florida, Princeton and Texas) and eight juniors. Oct. 12-18 -- $50,000 Fairfield Men's Pro Challenger (qualifying begins Oct. 10). Champions in 2014 (Napa): Sam Querrey, Peter Polansky/Adil Shamasdin. Stanford's Carol Zhao reached the NCAA singles final in May. Stanford's Carol Zhao earned the top spot in the NCAA Division I preseason rankings, announced last week. Zhao, a 5-foot-5 (1.65-meter) junior from Canada, reached the NCAA singles final in May in Waco, Texas. She lost to North Carolina sophomore Jamie Loeb, who then turned pro. Cal's Maegan Manasse, a junior from Redondo Beach in the Los Angeles region, is ranked fourth, and USC's Giuliana Olmos, a senior from Fremont in the San Francisco Bay Area, is 10th. Manasse and Denise Starr, a junior from Brooklyn, N.Y., are rated third in doubles. On the men's side, UCLA junior Mackenzie McDonald of Piedmont in the Bay Area, is ranked third in singles and sixth in doubles with Martin Redlicki. Collin Altamirano, a sophomore at NCAA champion Virginia from Sacramento, is 27th in singles. The next NCAA rankings will be released on Jan. 5. The inaugural ITA/Oracle Masters in Malibu, Calif., highlighted the opening of the fall season last weekend. The Masters men's and women's singles titles went to Cameron Norrie of Texas Christian and Danielle Collins of Virginia, respectively. Zhao did not play in the tournament. USC's Giuliana Olmos, a senior from Fremont in the Bay Area, and Gabby Smith captured the Masters women's doubles title, and Virginia's Luca Corinteli and Ryan Shane took the men's doubles crown. The next big tournament is the All-American Championships. The women's event is scheduled for Oct. 8-11 in Pacific Palisades, Calif., and the men's is set for Oct. 8-12 in Tulsa, Okla.
Heidi El Tabakh is regaining her form after missing the first four months of this year. The Canadian, seeded eighth, overpowered Sherazad Reix, a Frenchwoman seeded fifth, 6-1, 6-3 Sunday to win The Ascension Project Women's $25,000 Challenger at Sun Oaks Tennis & Fitness in Redding, Calif.
El Tabakh, who will turn 29 on Friday, earned her sixth career Challenger singles title but only her second since 2012. Reix, 26, was seeking the first of her career. In Saturday's doubles final, top-seeded Ashley Weinhold and Caitlin Whoriskey of the United States beat second-seeded Michelle Sammons of South Africa and Varatchaya Wongteanchai of Thailand 6-2, 7-5. Weinhold and Whoriskey also won the $50,000 Sacramento Challenger in July. Dennis Novikov of Milpitas in the San Francisco Bay Area won his first career Challenger singles title on Sunday. The seventh-seeded Novikov beat fifth-seeded Ryan Harrison of Austin, Texas, 6-4, 7-5 on a hardcourt in the final of the $50,000 Cary (N.C.) Tennis Championships. Novikov, 21, soared 45 places in the world rankings to a career-high No. 163. Harrison, 23, improved 13 spots to No. 116. He reached a career-high No. 43 in 2012. The 6-foot-3 (1.90-meter) Novikov turned pro in 2013 after leading UCLA to the NCAA final as a sophomore. Second-seeded Deiton Baughman of Carson, Calif., beat unseeded Mackenzie McDonald of Piedmont in the San Francisco Bay Area 2-6, 6-3, 6-3 on Sunday to win the $10,000 Claremont USTA Pro Classic in Claremont, Calif. Neither player had lost a set in four matches entering the final. Baughman, 19, improved to 2-0 against McDonald, a 20-year-old junior at UCLA. Baughman won 7-6 (3), 6-0 in the first round of the Costa Mesa (Calif.) Futures in 2013. In an all-American doubles final, second-seeded Jean-Yves Aubone and Gonzales Austin edged top-seeded Hunter Nicholas and Junior Alexander Ore 7-5, 3-6 [10-6]. USC's Giuliana Olmos, a senior from Fremont in the San Francisco Bay Area, and Gabby Smith defeated Mami Adachi and Aldila Sutjiadi of Kentucky 6-2, 6-2 on Sunday to win the women's doubles title in the inaugural Oracle/ITA Masters in Malibu, Calif.
Olmos and Smith never lost more than three games in a set in their three matches. "We came in with not many expectations and just tried to get off to a fast start in every match," Olmos said on itatennis.com. Fourth-seeded Danielle Collins of Virginia won the women's singles title by walkover. Unseeded Hayley Carter of North Carolina was unable to play after suffering a wrist injury on Saturday. Collins captured last year's NCAA title, beating Cal's Lynn Chi in the final in Athens, Ga.
Cameron Norrie of Texas Christian won the Oracle/ITA Masters men's singles title with a 6-3, 7-6 (2) victory over Nicolas Alvarez of Duke. Both players were unseeded. In the men's doubles final, second-seeded Luca Corinteli and Ryan Shane of NCAA champion Virginia topped unseeded Guilherme Hadlich and Gabriel Sidney of Pepperdine 7-5, 6-4. Shane won the NCAA singles title in May in Waco, Texas. Cal's Andre Goransson and USF's Andrea Ka swept singles and doubles titles today in the Battle in the Bay Classic in San Francisco. The top-seeded Goransson, a junior from Sweden, defeated Alec Adamson of UC Davis 6-4, 7-5 in men's singles. The second-seeded team of Goransson and Florian Lakat, a junior transfer from Paris, beat Jordan Angus and Filip Vittek of the University of San Diego 8-5 in men's doubles. The fourth-seeded Ka, a senior from Paris, outlasted Laura Gulbe of Pepperdine 5-7, 7-6 (4), 6-4 in women's singles. The top-seeded pair of Ka and Thyra Taune, a junior from Sweden, edged Gulbe and Dzina Milovanovic 8-7 (6). In just over two weeks, Jack Sock went from incapacitated to Davis Cup hero. Sock, who collapsed during his second-round match in the U.S. Open and retired with severe cramps, led the United States over Uzbekistan 3-1 in Tashkent, Uzbekistan, this weekend in his Davis Cup debut. The United States will remain in the 16-team World Group in 2016, while Uzbekistan will stay in zonal competition. The 29th-ranked Sock defeated No. 62 Denis Istomin 6-2, 2-6, 6-4, 6-4 today to clinch the Americans' victory. The last match, between Steve Johnson of the United States and Farrukh Dustov, was not played. Sock, who will turn 23 on Thursday, beat the 158th-ranked Dustov 7-5, 6-3, 6-2 on Friday to tie the series 1-1. Johnson and Sam Querrey, a San Francisco native, then outclassed Dustov and Istomin 6-3, 6-2, 6-2 on Saturday for a 2-1 lead. Vania King said on Tuesday that she needed to get much stronger to return to the top 100 in the world. The unseeded American lost to eighth-seeded Heidi El Tabakh of Canada 7-6 (3), 2-6, 6-1 on Saturday in the semifinals of The Ascension Project Women's $25,000 Challenger in Redding, Calif.
King, 5-foot-5 (1.65 meters), returned to competition in August after missing almost one year with a herniated disc in her neck. She reached a career-high No. 50 in 2006 and finished the year in the top 100 from 2009 through 2013 but has tumbled to No. 773. King also climbed to No. 3 in doubles in 2011 after winning Wimbledon and the U.S. Open in 2010 with Yaroslava Shvedova of Kazakhstan. El Tabakh, who will turn 29 on Friday, will face fifth-seeded Sherazad Reix of France for the title today at 12:30 p.m. at Sun Oaks Tennis & Fitness. Admission is free. Reix, 26, beat seventh-seeded Paula Cristina Goncalves of Brazil 6-4, 6-4. Reix and El Tabakh -- ranked No. 273 and No. 421, respectively -- have met only once, and that was seven years ago. El Tabakh won 7-6 (7), 3-6, 7-5 on a hardcourt in the second round of qualifying in the $25,000 Coimbra (Portugal) Challenger. El Tabakh was ranked No. 174 at the end of 2014 but missed the first four months of this year. She seeks her sixth career Challenger singles title and Reix her first. Top-seeded Ashley Weinhold and Caitlin Whoriskey of the United States won the doubles title, beating second-seeded Michelle Sammons of South Africa and Varatchaya Wongteanchai of Thailand 6-2, 7-5. Weinhold and Whoriskey also won the $50,000 Sacramento Challenger in July. In a matchup of unseeded Northern Californians, Mackenzie McDonald beat Collin Altamirano 6-2, 6-2 Saturday in the semifinals of the $10,000 Claremont USTA Pro Classic in Claremont, Calif.
McDonald, a UCLA junior All-American from Fremont in the San Francisco Bay Area, evened his career record against Altamirano, a sophomore at reigning NCAA champion Virginia from Sacramento, at 1-1. Altamirano defeated McDonald 3-6, 6-4, 6-3 in the boys round of 16 at the 2013 U.S. Open. McDonald will play second-seeded Deiton Baughman, 19, of Carson today for the Claremont title. Baughman topped Sebastian Fanselow, a former Pepperdine All-American from Germany, 6-3, 6-3. Altamirano knocked off top-seeded Marcos Giron in the first round. Giron turned pro last year after winning the NCAA singles title as a junior at UCLA. Danielle Collins of Virginia again dashed Cal's hopes on Saturday. The fourth-seeded Collins beat top-seeded Maegan Manasse 6-3, 6-7 (3), 6-4 to reach the final of the inaugural Oracle/ITA Masters in Malibu, Calif. Earlier Saturday in the quarterfinals, Manasse defeated Luisa Stefani of host Pepperdine 7-5, 6-2, and Collins trounced Sinead Lohan of Miami 6-1, 6-0. Collins defeated two Cal players, Anett Schutting in the second round and Lynn Chi in the final, at the 2014 NCAA Championships in Athens, Ga. Schutting has completed her eligibility, but Chi is a senior. Collins will face Hayley Carter of North Carolina in today's final. Carter beat Giuliana Olmos, a USC senior from Fremont in the San Francisco Bay Area, 6-4, 6-3 in the quarterfinals and Joana Eidukonyte of Clemson 6-2, 6-4 in the semifinals. Olmos ousted second-seeded Stephanie Wagner of Miami in the first round on Friday. Olmos will play for the doubles title with fellow Trojan Gabby Smith. They defeated No. 2 seeds Sydney Campbell and Courtney Colton of reigning NCAA champion Vanderbilt 6-2, 6-3. Olmos and Smith will meet Mami Adachi and Aldila Sutjiadi of Kentucky. Adachi and Sutjiadi toppled No. 1 seeds Manasse and Denise Starr 7-6 (3), 6-3. Sam Querrey, a San Francisco native, and Steve Johnson routed Farrukh Dustov and Denis Istomin 6-3, 6-2, 6-2 today to give the United States a 2-1 lead over Uzbekistan in Tashkent, Uzbekistan, in the Davis Cup World Group Playoffs. In Sunday's reverse singles, Jack Sock of the United States will face Istomin, and Johnson will play Dustov. The winner of the best-of-five series will remain in the World Group in 2016, and the loser will be relegated to zonal competition. Querrey and Johnson stunned top-seeded Bob Bryan and Mike Bryan in the first round of the recent U.S. Open en route to the semifinals. Two Northern Californians will meet in today's semifinals at the $10,000 Claremont USTA Pro Classic in Claremont, Calif.
Collin Altamirano, a sophomore at reigning NCAA champion Virginia from Sacramento, whipped fifth-seeded Daniel Garza of Mexico 6-2, 6-0 on Friday. McDonald, a junior All-American at UCLA from Piedmont, defeated qualifier Tom Fawcett, a sophomore at Pacific-12 Conference rival Stanford, 6-2, 6-4. Altamirano beat McDonald 3-6, 6-4, 6-3 in the boys round of 16 at the 2013 U.S. Open in their only career meeting. In the other semifinal, second-seeded Deiton Baughman, 19, of Carson, Calif., will play former Pepperdine All-American Sebastian Fanselow of Germany. Giuliana Olmos, a USC senior from Fremont in the San Francisco Bay Area, upset second-seeded Stephanie Wagner of Miami 4-6, 7-6 (4), 6-3 on Friday in the first round of the inaugural Oracle/ITA Masters in Malibu, Calif.
Olmos, ranked 10th nationally, fought off a match point in the second set. Wagner, a senior from Germany, is ranked sixth. She reached the NCAA singles semifinals in Waco, Texas, in May. Olmos will face Haley Carter of North Carolina in today's quarterfinals. Carter defeated Ronit Yurovsky of Michigan 6-4, 7-6 (4). Top-seeded Maegan Manasse of Cal defeated Kiah Generette of Baylor 7-5, 6-4. Manasse, a junior from Redondo Beach, Calif., will meet Luisa Stefani of host Pepperdine. Stefani beat Astra Sharma of reigning NCAA champion Vanderbilt 4-6, 7-5, 7-5. Klara Fabikova of Cal lost to Joana Eidukonyte of Clemson 6-4, 6-7 (4), 6-2. In the first round of the eight-team doubles event, top-seeded Manasse and Denise Starr crushed Sinea Lohan and Wagner 6-1, 6-0. Also, Olmos and Gabby Smith outclassed Saska Gavrilovska and Rachel Pierson of Texas A&M 6-2, 6-3. The breaks have gone Sherazad Reix's way in The Ascension Project Women's $25,000 Women's Challenger in Redding, Calif.
Not only service breaks but lucky breaks. The 26-year-old Frenchwoman, seeded fifth, played her first-round match on Tuesday. Therefore, she didn't have to play two singles matches on Thursday after the scheduled completion of the first round on Wednesday was rained out. A fresh Reix dispatched second-seeded Varatchaya Wongteanchai of Thailand 6-0, 6-4 in Friday's quarterfinals at Sun Oaks Tennis & Fitness. Wongteanchai played six sets, four in singles and two in doubles, on Thursday. Reix lost in the first round of doubles on Tuesday. Reix, ranked 14th in France at No. 273 in the world, will meet seventh-seeded Paula Cristina Goncalves of Brazil in today's first semifinal at 12:30 p.m. Goncalves, 25, outlasted Anna Zaja of Germany 6-3, 1-6, 6-4. After the Reix-Goncalves match, Vania King of Boca Raton, Fla., will take on eighth-seeded Heidi El Tabakh of Canada. King, a former top-50 singles player and a two-time Grand Slam champion in women's doubles, routed sixth-seeded Caitlin Whoriskey, a Boston native, 6-2, 6-1. King is playing in her fifth tournament after missing almost one year with a herniated disc in her neck. El Tabakh, who will turn 29 on Friday, topped Klaartje Liebens of Belgium 7-5, 7-5. Liebens lost in the quarterfinals for the second consecutive year. At Sun Oaks Tennis & Fitness in Redding, Calif.
Paula Cristina Goncalves (7), Brazil, def. Anna Zaja, Germany, 6-3, 1-6, 6-4. Vania King, United States, def. Caitlin Whoriskey (6), United States, 6-2, 6-1. Sherazad Reix (5), France, def. Varatchaya Wongteanchai (2), Thailand, 6-0, 6-4. Heidi El Tabakh (8), Canada, def. Klaartje Liebens, Belgium, 7-5, 7-5. Ashley Weinhold and Caitlin Whoriskey (1), United States, def. Alexandra Facey and Kat Facey, Cameron Park, 6-0, 6-1. Paula Cristina Goncalves (7), Brazil, vs. Sherazad Reix (5), France. Vania King, United States, vs. Heidi El Tabakh (8), Canada. Ashley Weinhold and Caitlin Whoriskey (1), United States, vs. Michelle Sammons, South Africa, and Varatchaya Wongteanchai (2), Thailand. REDDING, Calif. -- Vania King's victory over top seed and defending champion Jennifer Brady highlighted a long day in The Ascension Project Women's $25,000 Challenger. King, a former top-50 player and a two-time Grand Slam champion in women's doubles, defeated Brady 6-3, 7-6 (2) on Thursday at Sun Oaks Tennis & Fitness in a first-round match that had been postponed by rain. King, a 26-year-old Southern California native, then outlasted American wild card Julia Jones 3-6, 6-4, 7-5 and withdrew from her doubles quarterfinal, also scheduled for Thursday, with Robin Anderson. Brady, who turned pro in June after two stellar seasons at UCLA, at times employed her whipping forehand to rocket passing shots past King in their first career meeting. More often, the 5-foot-5 (1.65-meter) King used her quickness to keep the ball in play until Brady slugged the ball out. Brady jumped out to a 3-0 lead (one service break) in the 9 a.m. match, but King reeled off the next seven games, including a Brady double fault on set point. Brady broke serve to lead 6-5 in the second set, but King, aided by a double fault for 0-40, broke back at love to force a tiebreaker. Brady made three consecutive unforced errors to trail 4-0 and couldn't recover. "She's an experienced player," Brady said of King, 26. "She knows how to play the big points well. She makes you play." King is playing in her fifth tournament after missing almost one year with a herniated disc in her neck. She declined an interview request after defeating Brady, saying she had to prepare for her next match. Also falling were No. 3 seed Jovana Jaksic of Serbia and No. 4 Lauren Embree of Santa Monica. Chiara Scholl of the United States outlasted Jaksic 6-2, 5-7, 6-4 in the first round before losing to Klaartje Liebens of Belgium 6-4, 6-3. Liebens reached the quarterfinals for the second consecutive year. Scholl had two match points at 5-4 in the second set against Jaksic but failed to capitalize on them. "I think I played well overall," Scholl said. "I was getting really tired in the third set, so I'm glad I could still pull it out. She gave me a lot of free points in the last game of the third set. That was lucky for me." Anna Zaja of Germany beat Embree, last year's runner-up, 6-4, 6-0 in the second round. They played their opening matches on Tuesday before rain wiped out Wednesday's singles schedule. Embree's bid for a third straight Redding doubles title ended when she and Ema Burgic Bucko of Bosnia and Herzegovina pulled out of today's scheduled semifinal against second-seeded Michelle Sammons of South Africa and Varatchaya Wongteanchai of Thailand. Embree, a former University of Florida All-American, won in 2013 with Anderson and last year with Brady. Vania King, United States, def. Jennifer Brady (1), United States, 6-3, 7-6 (2). Chiara Scholl, United States, def. Jovana Jaksic (3), Serbia, 6-2, 5-7, 6-4. Klaartje Liebens, Belgium, def. Amy Zhu, United States, 7-6 (9), 6-1. Nadja Gilchrist, United States, def. Sophie Chang, United States, 7-5, 6-3. Heidi El Tabakh (8), Canada, def. Alexandra Stevenson, United States, 7-5, 7-5. Paula Cristina Goncalves (7), Brazil, def. Megan McCray, United States, 6-1, 6-3. Varatchaya Wongteanchai (2), Thailand, def. Ashley Weinhold, United States, 7-6 (1), 7-6 (5). Vania King, United States, def. Julia Jones, United States, 3-6, 6-4, 7-5. Caitlin Whoriskey (6), United States, def. Piia Suomalainen, Finland, 6-7 (5), 7-5, 6-1. Klaartje Liebens, Belgium, def. Chiara Scholl, United States, 6-4, 6-3. Heidi El Tabakh (8), Canada, def. Nadja Gilchrist, United States, 6-2, 6-2. Paula Cristina Goncalves (7), Brazil, def. Petra Rampre, Slovenia, 6-2, 6-2. Anna Zaja, Germany, def. Lauren Embree (4), United States, 6-4, 6-0. Sherazad Reix (5), France, def. Maegan Manasse, United States, walkover. Varatchaya Wongteanchai (2), Thailand, def. Lauren Albanese, United States, 6-3, 6-0. Ashley Weinhold and Caitlin Whoriskey (1), United States, def. Jennifer Brady, United States, and Caroline Doyle, San Francisco, 6-4, 6-3. Alexandra Facey and Kat Facey, Cameron Park, def. Robin Anderson and Vania King, United States, walkover. Ema Burgic Bucko, Bosnia and Herzegovina, and Lauren Embree, United States, def. Darya Possokhova, San Francisco, and Seriana Saltzen, Cameron Park, 6-2, 6-2. Michelle Sammons, South Africa, and Varatchaya Wongteanchai (2), Thailand, def. Laura Schaeder and Anna Zaja, Germany, 6-3, 6-4. Michelle Sammons, South Africa, and Varatchaya Wongteanchai (2), Thailand, def. Ema Burgic Bucko, Bosnia and Herzegovina, and Lauren Embree, United States. Paula Cristina Goncalves (7), Brazil, vs. Anna Zaja, Germany. Vania King, United States, vs. Caitlin Whoriskey (6), United States. Ashley Weinhold and Caitlin Whoriskey (1), United States, vs. Alexandra Facey and Kat Facey, Cameron Park. Varatchaya Wongteanchai (2), Thailand, vs. Sherazad Reix (5), France. Heidi El Tabakh (8), Canada, vs. Klaartje Liebens, Belgium. Collin Altamirano of Sacramento defeated qualifier Martin Redlicki of Boca Raton, Fla., 6-4, 3-6, 6-0 on Thursday to reach the quarterfinals of the $10,000 Claremont USTA Pro Classic in Claremont, Calif.
Altamirano, a sophomore at reigning NCAA champion Virginia, ousted top-seeded Marcos Giron in the first round. Giron, 22, of Thousand Oaks, Calif., turned pro last year after winning the NCAA singles title as a UCLA junior. Altamirano will face fifth-seeded Daniel Garza, a 30-year-old Mexican who beat qualifier Junior Ore 6-3, 3-6, 6-3 to reach the quarters for the second consecutive year. Redlicki, 6-foot-5 (1.96 meters), is a sophomore at UCLA. His teammate, junior Mackenzie McDonald of Piedmont in the San Francisco Bay Area, topped Hunter Nicholas 7-5, 7-5. McDonald will meet qualifier Tom Fawcett, a Stanford sophomore who knocked off third-seeded Jean-Yves Aubone of the United States, 3-6, 6-3, 6-4. Aubone reached the semifinals last year. David Wilczynski, another Stanford sophomore, lost to fourth-seeded Ernesto Escobedo of the United States 6-3, 6-1. REDDING, Calif. -- Perhaps more than anyone else, Vania King can appreciate Roberta Vinci's monumental upset of Serena Williams last week at Arthur Ashe Stadium in the semifinals of the U.S. Open. Vinci's shocking run to the final, in which she lost to fellow Italian Flavia Pennetta, began with a 6-4, 6-4 victory over King on an outside court. King also fell to Williams 6-1, 6-0 at Ashe in the second round at Flushing Meadows last year. "I admire (Vinci) very much because she's one of the most underrated players," said King, who is scheduled to play top seed and defending champion Jennifer Brady today at 9 a.m. in the rain-delayed first round of The Ascension Project Women's $25,000 Challenger at Sun Oaks Tennis & Fitness. "She's had a terrific career. She's been in the top 40 for many, many years, and she's been in the top 20. "If you look at her, she's not an imposing person, and her personality is not imposing at all. She's very quiet and respectful. I actually admire the sportsmanship side much more than the tennis side, but I also admire her game." King, who's playing in her fifth tournament after missing almost one year because of a herniated disc in her neck, described Vinci's game as "very tricky. She's a very smart player. She uses her slice very well. She's very consistent with her slice. It's very difficult to play because it stays low, and she waits for the opportunity to attack with her forehand." King, in fact, is something of a poor woman's Vinci. Both are small. King, a 26-year-old Long Beach product whose Taiwanese parents ran a fish and chips restaurant for 25 years, is 5-foot-5 (1.65 meters). Vinci, the 32-year-old daughter of an accountant father and homemaker mother, is 5-foot-4 (1.63). Largely for that reason, both have had more success in doubles than singles. Both are multiple Grand Slam champions in women's doubles. Vinci has won five majors, including a career Grand Slam, and King two (Wimbledon and the U.S. Open in 2010 with Yaroslava Shvedova of Kazakhstan). Vinci ascended to No. 1 in the world in women's doubles, and King reached No. 3. Vinci improved annually in the year-end singles rankings from No. 83 in 2008 to No. 14 in 2013. She jumped from No. 43 to No. 19 by reaching the U.S. Open final. King finished the year in the top 100, fluctuating between No. 70 and No. 86, from 2009 to 2013. Vinci's career high is No. 11 in 2013; King's is No. 50 in 2006. Also like Vinci, King is smart. She declined a scholarship offer from Stanford to turn pro in 2006. Even King's first name is similar to Roberta's last name. King conceded that Vinci had some luck at the U.S. Open, never playing a seed in five matches until facing Williams. In a bizarre twist, No. 25 Eugenie Bouchard of Canada withdrew from her scheduled fourth-round encounter against Vinci after falling in the locker room and suffering a concussion. "At the U.S. Open, things all fell into place for her, and I think she knows that," King said. "At the same time, all these opportunities presented themselves to her, and she took them. That's very, very difficult. ... She totally deserved the result that she had there." Williams, who had not dropped a set in four career matches against Vinci, fell 2-6, 6-4, 6-4 this time. "I think Serena was dealing with nerves trying to complete the calendar Slam," said King, who watched most of the match on television. King was a nervous wreck herself in her only career match against Williams but "not necessarily because of her. She was very imposing, but (it was) just because of the environment I was in, being on Ashe with so many people and cameras there. It was very overwhelming." Williams' tenacity impressed King the most. "I think Serena is mentally the strongest player," King said. "Granted, her game is incredible, but I think what really keeps her (on top) is her mental consistency and strength." Was King surprised, then, that nerves apparently contributed to Williams' loss in the U.S. Open? "Yes and no," replied King, who sang "America the Beautiful" at Ashe during the 2006 U.S. Open before the last victory of Andre Agassi's career. "We put her on a pedestal and think she should perform the same way every time, but none of us can imagine what it's like to have to deal with breaking a record that's (almost) 30 years old. She's already going to go down in history as the best player, but this would have been the cherry on top." King had been feeling "a lot of nerve pain and limited mobility in my neck" for three months before facing Williams. An MRI a few weeks before the U.S. Open revealed a herniated disc caused "over time being a tennis player, putting my body into unusual positions," King said. King rested for eight months in Long Beach, avoiding surgery. She relaxed for the first month, volunteered for the charities Nothing But Nets and Acing Autism, and worked as a substitute teacher for two months in the Los Angeles Unified School District. Nothing But Nets provides bed nets to fight malaria in Africa, and Acing Autism runs weekly tennis programs around the United States for children with autism. Substitute teaching in elementary and high school, King said, "really made me appreciate how difficult a teacher's job is. It's very different from being a tennis player. "It was difficult because you have to go into a different school every day, teach a different class and see so many different students. A lot of them were rowdy, and you have to learn how to manage the students, get the most out of them, and get them to follow the lesson plan of the teacher. It was a great experience." King began hitting again in May and returned to competition last month in a $25,000 Challenger in Landisville, Pa. Since winning her first match, she has lost four straight. Going from finals at fabled Centre Court at Wimbledon and massive Arthur Ashe Stadium to humble Sun Oaks Tennis & Fitness is jolting. But at least King is playing tennis again. "(Redding) is a steppingstone," conceded King, whose ranking has plunged to No. 773. "This is not where I want to be, but I'm enjoying every moment of it. I'm really happy to be back on the court. I'm lucky to be back on the court. I didn't know if I'd be able to play again. "My goal is to get my ranking back up to the top 100, hopefully as fast as I can, but I've got to get a lot stronger. I've only been playing for a few months. I was out for eight months. I've got to play a lot of matches and keep my head up." Collin Altamirano of Sacramento stunned top-seeded Marcos Giron, last year's NCAA singles champion from UCLA, 3-6, 6-3, 6-3 today in the first round of the $10,000 Claremont USTA Pro Classic in Claremont in the Los Angeles area. Altamirano, a sophomore at the University of Virginia, helped the Cavaliers win the NCAA team title in May. He was named to the All-Tournament Team at No. 3 singles and No. 3 doubles. Giron, from Thousand Oaks in the Los Angeles region, turned pro after winning the NCAA crown as a junior. He defeated Altamirano 6-2, 6-2 in the second round of qualifying in the $100,000 Tiburon Challenger last October en route to the quarterfinals. Altamirano is scheduled to play qualifier Martin Redlicki, a 6-foot-5 UCLA sophomore from Boca Raton, Fla., on Thursday. Redlicki outlasted another qualifier, Bernardo Saraiva, 4-6, 6-2, 6-4. Saraiva, from Portugal, completed his eligibility at the University of San Francisco in May. Also advancing were Mackenzie McDonald, a UCLA junior All-American from Piedmont in the San Francisco Bay Area, and Stanford sophomores Tom Fawcett and David Wilczynski, both qualifiers. McDonald beat sixth-seeded Evan Song of the United States 6-4, 6-4. REDDING, Calif. -- All seven opening-round singles matches scheduled for today in The Ascension Project Women's $25,000 Challenger were postponed by rain. The other nine first-round singles matches were played on Tuesday. Four doubles matches, completing the first round, were played indoors at Sun Oaks Tennis & Fitness, the site of the tournament, this afternoon. In a match between sister pairs, Alexandra and Kat Facey of Cameron Park in the Sacramento area edged Megan and Morgan McCray of Oceanside in Southern California 6-3, 4-6 [10-5]. The Faceys, last year's runners-up, are 22-year-old twins. Morgan, 21, is one year older than Megan. Lauren Embree, seeking her third straight Redding doubles title, and Ema Burgic Bucko of Bosnia and Herzegovina ousted No.3 seeds Paula Cristina Goncalves of Brazil and Jovana Jaksic of Serbia 6-4, 6-1. Embree won last year with Jennifer Brady and in 2013 with Robin Anderson. Also today, Brady and Caroline Doyle, a Stanford junior All-American from San Francisco, defeated Brynn Boren and Nadja Gilchrist 6-4, 7-5. Tournament director Julie Garcia said no singles matches were scheduled on the three indoor courts so club members could use them in the morning. Thursday's matches are scheduled to start one hour earlier at 9 a.m. on four outdoor courts rather than three. The forecast is for partly cloudy weather with a high of 77 degrees (25.0 Celsius). Redding's customary scorching September weather is expected to return from Friday's quarterfinals through Sunday's finals. Weather permitting, the winners of Wednesday's postponed matches will play twice in singles on Thursday. Including doubles, some competitors could play three matches in one day. Highlighting Thursday's schedule is a first-round singles match between top seed and defending champion Brady and Vania King, a former top-50 singles player and a two-time Grand Slam champion in women's doubles. King is playing her fifth tournament after missing almost one year with a herniated disc in her neck. Redding alumni include two-time Australian Open champion Victoria Azarenka of Belarus and Lucie Safarova, who's ranked a career-high fifth in the world, of the Czech Republic. Ten years ago, Safarova won the title at age 18, and Azarenka reached the quarterfinals at 15. Note to readers: A feature story on King will be posted tonight. Ema Burgic Bucko, Bosnia and Herzegovina, and Lauren Embree, United States, def. Paula Cristina Goncalves, Brazil, and Jovana Jaksic (3), Serbia, 6-4, 6-1. Laura Schaeder and Anna Zaja, Germany, def. Lorraine Guillermo and Julia Jones, United States, 7-6 (3), 6-4. Alexandra Facey and Kat Facey, Cameron Park, def. Megan McCray and Morgan McCray, United States, 6-3, 4-6 [10-5]. Jennifer Brady, United States, and Caroline Doyle, San Francisco, def. Brynn Boren and Nadja Gilchrist, United States, 6-4, 7-5. Jennifer Brady (1), United States, vs. Vania King, United States. Paula Cristina Goncalves, Brazil, vs. Megan McCray, United States. Lauren Embree (4), United States, vs. Anna Zaja, Germany. Petra Rampre, Slovenia, vs. Paula Cristina Goncalvez, Brazil, or Megan McCray, United States. Ashley Weinhold and Caitlin Whoriskey (1), United States, vs. Jennifer Brady, United States, and Caroline Doyle, San Francisco. Jovana Jaksic (3), Serbia, vs. Chiara Scholl, United States. Nadja Gilchrist, United States, vs. Sophie Chang, United States. Jovana Jaksic (3), Serbia, or Chiara Scholl, United States, vs. Klaartje Liebens, Belgium, or Amy Zhu, United States. Nadja Gilchrist, United States, or Sophie Chang, United States, vs. Heidi El Tabakh (8), Canada, or Alexandra Stevenson, United States. Robin Anderson and Vania King, United States, vs. Alexandra Facey and Kat Facey, Cameron Park. Amy Zhu, United States, vs. Klaartje Liebens, Belgium. Heidi El Tabakh (8), Canada, vs. Alexandra Stevenson, United States. Julia Jones, United States, vs. Jennifer Brady (1), United States, or Vania King, United States. Ema Burgic Bucko, Bosnia and Herzegovina, and Lauren Embree, United States, vs. Darya Possokhova, San Francisco, and Seriana Saltzen, Cameron Park. Ashley Weinhold, United States, vs. Varatchaya Wongteanchai (2), Thailand. Caitlin Whoriskey (6), United States, vs. Piia Suomalainen, Finland. Lauren Albanese, United States, vs. Varatchaya Wongteanchai (2), Thailand, or Ashley Weinhold. Michelle Sammons, South Africa, and Varatchaya Wongteanchai (2), Thailand, vs. Laura Schaeder and Anna Zaja, Germany.